BTXpress Cytoporation® Media T4 is an advanced electroporation buffer designed for use with the BTX AgilePulse MAX Large Volume Electroporation Systems for ex vivo or in vitro delivery of DNA, RNA, oligonucleotides, and siRNA. The low conductivity buffer is specially formulated to minimize heating of solution during large volumes electroporation for maximum transfection efficiency and high cell viability. BTXpress Cytoporation Media T4 is sterile filtered from the highest quality non-animal, medical-grade reagents. Two formulations with different conductivities are available for optimum conductivity for each eukaryotic cell types. Buffer can be directly diluted in complete growth media for post-electroporation cell culture. Standard aseptic techniques are recommended to avoid contamination during use. Thorough, repeated wash-in. BTXpress Cytofusion® Medium C, is a low conductivity medium designed for efficient electrofusion. Trace amounts of high conductivity solutions such as PBS or tissue culture growth medium can disrupt the fusion process. Therefore, it is critical to wash the cells thoroughly with BTXpress Cytofusion® Medium C prior to the fusion process. For up to 5 x 107 cells, at least two washes in BTXpress Cytofusion® Medium C are recommended. For more than 5 x 107 cells, at least three washes are recommended. Thoroughly clean electrofusion chamber. To avoid other sources of ionic contamination, clean the electrofusion chamber after each use and rinse thoroughly with sterile, deionized water. For maximum efficiency cell fusion, use BTXpress Cytofusion® Medium C at room temperature. Cell washes prior to the final wash may be carried out at 4°C. While Cytofusion® Medium C is non-toxic, it does not contain nutrients to support cell viability over long periods of time. 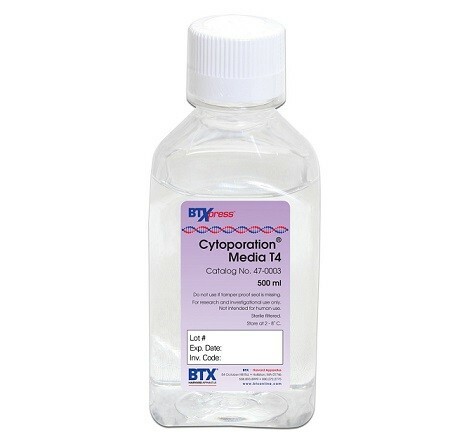 For best results, minimize the time that cells are suspended in BTXpress Cytofusion® Medium C. It is not recommended that cells remain in BTXpress Cytofusion® Medium C longer than one hour subsequent to the final wash.
Post-electrofusion, Cells in BTXpress Cytofusion® Medium C can be diluted in cell culture medium without washing the cells. A minimum dilution of five parts complete culture medium to one part BTXpress Cytofusion® Medium C is recommended. Alternatively, cells may be washed in growth medium to completely remove BTXpress Cytofusion® Medium C prior to culturing. Do not use if tamper-proof seal is missing or bottle is damaged. Damage to the bottle or deliberate tampering may result in contamination of this product. Check product for clarity before use. BTXpress Cytofusion® Medium is intended for research and investigational purposes only. It is not intended for human use. This product is not considered to be hazardous based on evaluations made under OSHA Hazard Communication Standard 29 CFR 1910.1200.